Objective To assess the impact of incretin based treatment on all cause mortality in patients with type 2 diabetes. Design Systematic review and meta-analysis of randomised trials. Data sources Medline, Embase, the Cochrane Central Register of Controlled Trials (CENTRAL), and ClinicalTrials.gov. Eligibility criteria Randomised controlled trials that compared glucagon-like peptide-1 (GLP-1) receptor agonists or dipeptidyl peptidase-4 (DPP-4) inhibitors with placebo or active anti-diabetic drugs in patients with type 2 diabetes. Data collection and analysis Paired reviewers independently screened citations, assessed risk of bias of included studies, and extracted data. Peto’s method was used as the primary approach to pool effect estimates from trials, sensitivity analyses were carried out with other statistical approaches, and meta-regression was applied for six prespecified hypotheses to explore heterogeneity. The GRADE approach was used to rate the quality of evidence. Results 189 randomised controlled trials (n=155 145) were included, all of which were at low to moderate risk of bias; 77 reported no events of death and 112 reported 3888 deaths among 151 614 patients. 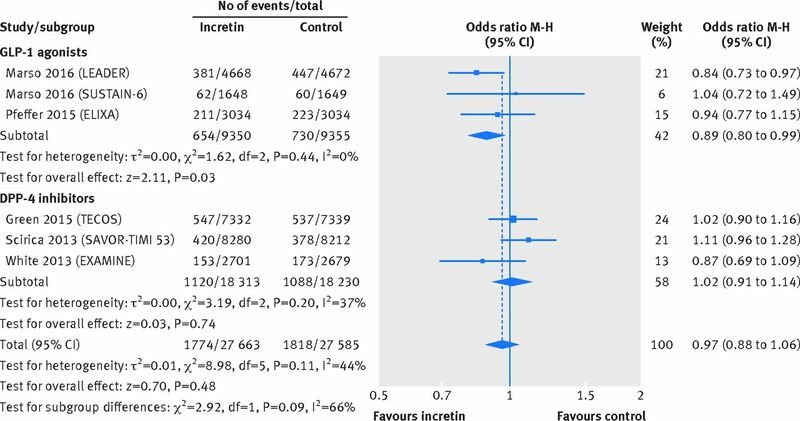 Meta-analysis of 189 trials showed no difference in all cause mortality between incretin drugs versus control (1925/84 136 v 1963/67 478; odds ratio 0.96, 95% confidence interval 0.90 to 1.02, I2=0%; risk difference 3 fewer events (95% confidence interval 7 fewer to 1 more) per 1000 patients over five years; moderate quality evidence). Results suggested the possibility of a mortality benefit with GLP-1 agonists but not DPP-4 inhibitors, but the subgroup hypothesis had low credibility. Sensitivity analyses showed no important differences in the estimates of effects. Conclusions Current evidence does not support the suggestion that incretin based treatment increases all cause mortality in patients with type 2 diabetes. Further studies are warranted to examine if the effect differs between GLP-1 agonists versus DPP-4 inhibitors. This observation raised concern as to whether incretin based treatments could be associated with increased mortality; however, findings from other large trials were inconsistent. The TECOS14 and the EXAMINE trial15—testing effects of sitagliptin and alogliptin—found no significant increase in mortality. Evidence from observational studies is also inconsistent.161718192021 We therefore carried out a systematic review and meta-analysis of randomised controlled trials to determine the effect of incretin based treatments on mortality in patients with type 2 diabetes. We included randomised controlled trials that compared GLP-1 agonists or DPP-4 inhibitors against placebo, lifestyle modification, or active anti-hyperglycaemic drugs in patients with type 2 diabetes. Eligible studies reported ≥12 weeks’ follow-up and explicitly reported data on all cause mortality. Paired reviewers, trained in research methods, independently and in duplicate screened titles/abstracts and full texts for eligible articles, assessed risk of bias, and extracted data from each eligible study using standardised pilot tested forms with detailed instructions. Reviewers dealt with discrepancies through discussion or, if necessary, arbitration by a third reviewer. Two reviewers independently assessed risk of bias of randomised controlled trials using a modified Cochrane risk of bias instrument that includes response options of “definitely or probably yes” (assigned a low risk of bias) or “definitely or probably no” (assigned a high risk of bias), an approach we have previously validated.252627 The items included random sequence generation; allocation concealment; blinding of participants, caregivers, outcome assessors and outcome adjudicators; infrequent missing outcome data; selective outcome reporting; and other sources of bias (details available at www.evidencepartners.com/resources/methodological-resources/). We conducted a meta-analysis of all included trials using the reported deaths from treatment and control groups. Given the low event rates in many trials, we used Peto’s method as the primary analysis to pool effect estimates across studies.29 We excluded studies in which no deaths occurred in either study arm. We conducted sensitivity analyses to examine the impact of using alternative effect measures (odds ratio versus relative risk), pooling methods (Peto versus Mantel-Hanszel (M-H)), statistical models (fixed versus random effects), continuity correction of 0.5 for trials with no events when pooling with the M-H method (versus excluding such trials),3031 and analysis of trials with two or more events (that is, excluding trials with no events or only one event). We generated a funnel plot and applied Egger’s test to examine publication bias. We also conducted an additional test for publication bias by excluding trials with only one event. We used the Cochran’s χ2 test and the I2 statistic to examine statistical heterogeneity. Following recent guidance for a credible subgroup effect,32 we planned six hypotheses to explain variability in effect estimates of all cause mortality between studies: risk of cardiovascular disease at baseline (with low versus high versus unclear risk; larger effect in patients with low risk of cardiovascular comorbidities at baseline); type of incretin drug (DPP-4 inhibitors versus GLP-1 agonists; larger effect in trials testing GLP-1 agonists); length of follow-up (52 weeks or shorter versus over 52 weeks; larger effect in trials with longer follow-up); type of control (placebo versus active treatment; larger effect in trials with placebo control); mode of treatment (monotherapy versus add on/combination; larger effect in trials with add on/combination treatment); and individual incretin drugs (different incretins). We conducted univariable random effects meta-regression for each of the six hypotheses, when there were at least 10 trials available for analysis. We also conducted a post hoc multiple regression analysis adjusting for risk of cardiovascular disease at baseline, type of incretin drug, length of follow-up, type of control, and mode of treatment. To explore consistency of an apparent subgroup effect, we additionally conducted two univariable exploratory subgroup analyses by type of incretin drug, one on all cause mortality and another on cardiovascular events, using data from the six large cardiovascular outcome trials that compared either GLP-1 agonists or DPP-4 inhibitors versus placebo. We used the GRADE approach to rate the quality of evidence and generate absolute estimates of effect for the outcomes.33 To calculate the absolute increase in risk for mortality, we estimated the baseline risk for death from a large cohort study16 that enrolled patients without previous myocardial infarction or stroke. Of 19 250 unique reports, reviewers judged 1187 as potentially eligible at title and abstract screening; of these, 189 randomised controlled trials involving 155 145 participants proved eligible (fig 1⇓). All 189 randomised controlled trials were funded by industry. Among those, 126 enrolled patients with type 2 diabetes at low risk of cardiovascular disease at baseline (specifically excluding patients with certain cardiovascular diseases), and 55 enrolled patients with unclear risk of cardiovascular disease at baseline (without mention of excluding patients with cardiovascular disease). The eight others enrolled patients at high risk of, or with established, cardiovascular disease at baseline, including six large cardiovascular outcomes trials (tables A and B in appendix 2). The six large cardiovascular outcome trials (TECOS,14 LEADER,34 SUSTAIN-6,35 ELIXA,36 SAVOR-TIMI 53,12 and EXAMINE15 trial) enrolled 3297 to 16 492 patients at high risk of, or with established, cardiovascular disease at baseline, followed patients for a median of 1.5 to 3.8 years, and evaluated one of six incretin agents (sitagliptin, liraglutide, semaglutide, lixisenatide, saxagliptin, or alogliptin) versus placebo. The trials enrolled similar patients: mean age range 60.3-65.0, mean BMI 29.5-32.8, mean baseline HbA1c 7.2-8.7%, mean fasting plasma glucose 8.2-8.7 mmol/L, and a mean or median duration of diabetes of 7.2-13.9 years (table A in appendix 2). Of the 183 other trials, 153 (83.6%) were clearly labelled as phase III studies. The length of follow-up was 12-234 weeks (median 24 weeks; interquartile range 24-52 weeks); the mean age of participants range was 49.7-74.9; mean or median BMI 21.7-37.1; mean baseline HbA1c 6.6%-10.2%; mean fasting plasma glucose 6.2-12.2 mmol/L; and mean or median duration of diabetes 1.0-15.9 years (table A in appendix 2); 119 tested DPP-4 inhibitors, 68 GLP-1 agonists, and four tested both agents; 130 tested incretin drug versus placebo, 69 versus active comparator, 16 versus both placebo and active comparator; 71 used incretin drugs as monotherapy, 121 as add on/combination treatment, and nine administered both treatment options (table C in appendix 2). Among the six large cardiovascular outcome trials, all adequately generated their randomisation sequence, concealed allocation, blinded patients and caregivers, and were free from reporting bias. Five (83.3%) trials had infrequent missing outcome data. The baseline characteristics were generally similar between treatment groups across all the trials (table D in appendix 2). Of the 183 other randomised controlled trials, 177 (96.7%) adequately generated their randomisation sequence, 170 (92.9%) concealed allocation, and 155 (84.7%) blinded patients and caregivers. The baseline characteristics were generally similar between treatment groups in each trial. Only 47 (25.7%), however, were free from frequent missing outcome data (table D in appendix 2). Of the 189 trials, 77 (40.7%) reported that no deaths occurred during the course of study. The 112 other trials (59.3%) reported 3888 deaths among 151 614 patients, of which 3592 (92.4%) were reported from the six large cardiovascular outcome trials. Our meta-analysis including the 112 trials that reported at least one death showed no difference in mortality between incretin drug versus control (1925/84 136 v 1963/67 478; odds ratio 0.96, 95% confidence interval 0.90 to 1.02, I2=0%; risk difference 3 fewer events (95% confidence interval 7 fewer to 1 more) per 1000 patients over five years; moderate quality evidence, rated down because of inconsistency between GLP-1 agonists and DPP-4 inhibitors) (fig 2⇓ and table 1⇓). Trials that compared incretin treatment against placebo or no treatment contributed 97% of the weight to the analysis, and trials with an active comparator 4%. 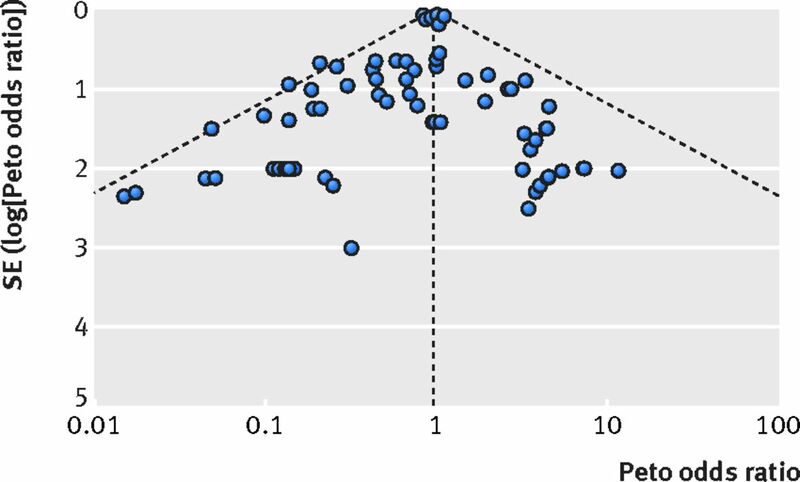 Our funnel plot and statistical test showed no evidence of publication bias (fig 3⇓, Egger’s test P=0.21). Our analysis excluding trials with no events or one event across arms found a similar result (fig A in appendix 3, Egger’s test P=0.33). Sensitivity analyses using an alternative effect measure (M-H relative risk 0.95, 95% confidence interval 0.90 to 1.01), pooling method (M-H odds ratio 0.95, 0.89 to 1.01), statistical model (random effects M-H odds ratio 0.95, 0.89 to 1.02), continuity correction of 0.5 for trials with no events (M-H odds ratio 0.95, 0.89 to 1.01), and by excluding trials with no events or one event across arms (Peto odds ratio 0.96, 0.90 to 1.02) showed similar results (table 2⇓). 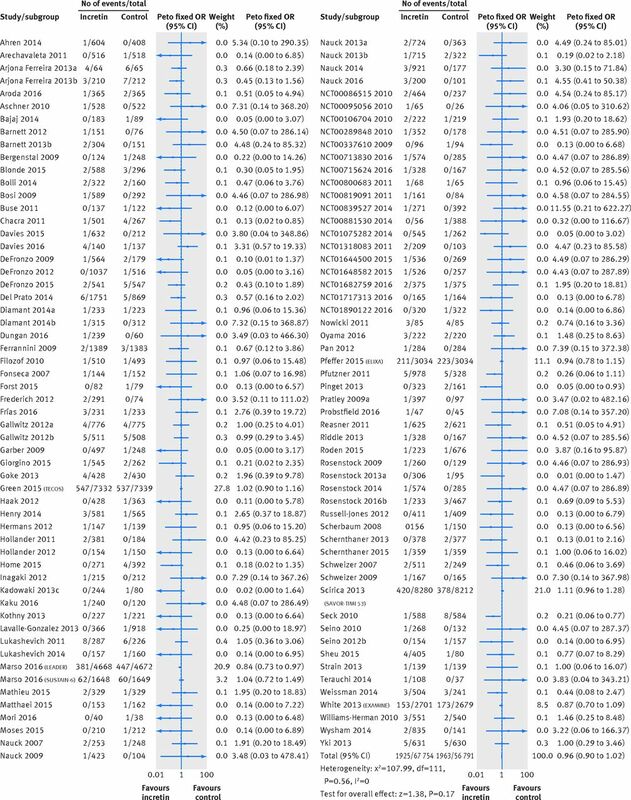 Univariable meta-regression showed no association between all cause mortality and any of our six subgroup factors (P=0.38 for length of follow-up; P=0.20 for risk of cardiovascular disease at baseline; P=0.52 for type of incretin drug; P=0.05 for type of control; P=0.80 for mode of treatment; P=0.86 for individual incretin agents; table 3⇓). Subgroup analyses by type of incretin drug (GLP-1 agonists or DPP-4 inhibitors), with data from six large randomised trials that compared incretin agents versus placebo, showed similar finding for all cause mortality (interaction test P=0.09; GLP-1 agonists versus placebo: 654/9350 v 730/9355; M-H odds ratio 0.89, 95% confidence interval 0.80 to 0.99; DPP-4 inhibitors versus placebo: 1120/18 313 v 1088/18 230; 1.02, 0.91 to 1.14; fig 4⇓) and composite cardiovascular events (interaction test P=0.19; GLP-1 agonists versus placebo: 1113/9350 v 1229/9355; 0.88, 0.74 to 1.04; DPP-4 inhibitors versus placebo: 1527/18 313 v 1527/18 230; 0.99, 0.92 to 1.07; fig 5⇓). Multiple meta-regression, adjusted for length of follow-up, risk of cardiovascular disease at baseline, type of control, and mode of treatment, suggested that GLP-1 agonists, but not DPP-4 inhibitors, are associated with lower all cause mortality (P=0.01 for interaction). Our systematic review and meta-analysis provides no support for the hypothesis that incretin based treatment is associated with increased mortality in patients with type 2 diabetes. This finding should reassure patients and clinicians and refutes the concern raised by the SAVOR-TIMI trial suggesting increased mortality. On the other hand, the subgroup analysis is based on a comparison between trials; it is not robust across statistical analyses (the effect did not appear in the univariable analysis but only in the meta-regression, and the meta-regression is at high risk of over-fitting—six trials account for 92.5% of the weight), and was not prespecified; the apparent reduction in mortality with GLP-1 is both small and of borderline significance. We thus conclude that the subgroup hypothesis has low credibility. Strengths of our review include a systematic and rigorous approach to the identification of randomised controlled trials investigating the impact of incretin based treatment on mortality. We conducted a limited number of preplanned subgroup analyses to explore for differences in risk of mortality. We used the GRADE approach to assess the quality of evidence that showed convincing evidence that incretin drugs do not increase mortality (table 1⇑). Our study also has limitations. Firstly, studies might selectively report data regarding death in their full publications, which could lead to risk of selection bias; we attempted to mitigate this risk by reviewing records on ClinicalTrials.gov for unreported deaths and included outcome data from 23 trial registry reports. Secondly, we were unable to assess the long term effects of these drugs: among the 189 trials, only 40 had long term follow-up over 52 weeks, and the longest follow-up in the large trials was 3.8 years. Our subgroup analysis suggesting a possible reduction in mortality with GLP-1 agonists but not with DPP4 inhibitors has limited credibility. We identified 11 trials reporting head-to-head comparison,4041424344454647484950 but with limited information—15 events from 6736 participants—and thus estimates were uninformative. Three previous meta-analyses515253 have reported the effect of GLP-1 agonists, versus placebo or active treatments, on all cause mortality among patients with type 2 diabetes. One, including 33 trials with more than 12 weeks’ follow-up, nine of which reported at least one death, showed that GLP-1 receptor agonists did not seem to be associated with increased mortality (odds ratio 0.67, 95% confidence interval 0.26 to 1.78)51; another one, including 33 trials with more than 24 weeks’ follow-up, 14 of which reported at least one death, found similar results (0.89, 0.46 to 1.70).52 The other recently published meta-analysis, including five trials with the outcome of mortality, found no effect of GLP-1 agonists on mortality (relative risk 0.90, 95% confidence interval 0.70 to 1.15).53 In comparison, our results, primarily based on large cardiovascular outcome trials, suggest that GLP-1 agonists could be associated with lower mortality in patients at high risk of, or with, established cardiovascular disease. Four previous meta-analyses have reported the effect of DPP-4 inhibitors, versus placebo or active treatments, on all cause mortality among patients with type 2 diabetes.54555657 Monami and colleagues, who included 41 trials with more than 12 weeks’ follow-up, 18 of which reported at least one death, suggested that DPP-4 inhibitors did not increase mortality (odds ratio 0.78, 95% confidence interval 0.40 to 1.51).54 Savarese and colleagues found no effect of DPP-4 inhibitors on mortality regardless of length of follow-up (relative risk 1.06, 95% confidence interval 0.56 to 2.01, for follow-up <29 weeks; 1.01, 0.91 to 1.13, for follow-up ≥29 weeks). 55 Wu and colleagues, who included 43 randomised controlled trials with 50 982 patients and 1228 deaths, found similar results (1.01, 0.91 to 1.13).56 The final study, also by Savarese and colleagues, included 66 trials with sample size more than 200 patients and report of at least one death, and again found no effect on mortality (odds ratio 1.01, 95% confidence interval 0.93 to 1.09).57 Our study, including 122 smaller trials and three larger trials, showed, with much narrower confidence intervals, that DPP-4 inhibitors had minimal or no impact on mortality. Our results provide no support for the hypothesis that incretin based treatment are associated with increased all cause mortality in patients with type 2 diabetes. Additional large well designed randomised trials with adequate follow-up will be necessary to definitively establish or refute possible differences in the effect of GLP-1 agonists and DPP-4 inhibitors on all cause mortality. We thank Daphne Plaut for developing the search strategy and conducting the initial literature search. Contributors: JL, LL, and KD contributed equally to this work. XS, LL, and POV conceived the study. XS acquired the funding. XS, JL, LL, and KD had full access to all of the data in the study, and take responsibility for the integrity of the data and the accuracy of the data analysis. JL, LL, KD and CX conducted the literature searches and extracted the data. All authors conducted the analysis and interpreted the data and critically revised the manuscript. JL, LL and KD drafted the manuscript. XS is guarantor. Funding: This study was supported by National Natural Science Foundation of China (grant No 71573183), “Thousand Youth Talents Plan” of China (grant No D1024002), and Sichuan Province, and Young Investigator Award of Sichuan University (grant No 2013SCU04A37). These funders had no role in the study design, writing of the manuscript, or decision to submit this or future manuscripts for publication. JWB is funded by a New Investigator Award from the Canadian Institutes of Health Research and Canadian Chiropractic Research Foundation. SL is funded by the National Natural Science Foundation of China (grant No 81400811 and 21534008). Competing interests: All authors have completed the ICMJE uniform disclosure form at www.icmje.org/coi_disclosure.pdf and declare: no support from any organisation for the submitted work; no financial relationships with any organisations that might have an interest in the submitted work in the previous three years, and no other relationships or activities that could appear to have influenced the submitted work. Transparency: The lead author (the manuscript’s guarantor) affirms that the manuscript is an honest, accurate, and transparent account of the study being reported; that no important aspects of the study have been omitted; and that any discrepancies from the study as planned have been explained. Nauck M. Incretin therapies: highlighting common features and differences in the modes of action of glucagon-like peptide-1 receptor agonists and dipeptidyl peptidase-4 inhibitors. Diabetes Obes Metab2016;357:203-16. doi:10.1111/dom.12591 pmid:26489970. Inzucchi SE, Bergenstal RM, Buse JB, et al. Management of hyperglycemia in type 2 diabetes, 2015: a patient-centered approach: update to a position statement of the American Diabetes Association and the European Association for the Study of Diabetes. Diabetes Care2015;357:140-9. doi:10.2337/dc14-2441 pmid:25538310. Tricco AC, Antony J, Khan PA, et al. Safety and effectiveness of dipeptidyl peptidase-4 inhibitors versus intermediate-acting insulin or placebo for patients with type 2 diabetes failing two oral antihyperglycaemic agents: a systematic review and network meta-analysis. BMJ Open2014;357:e005752. doi:10.1136/bmjopen-2014-005752 pmid:25537781. 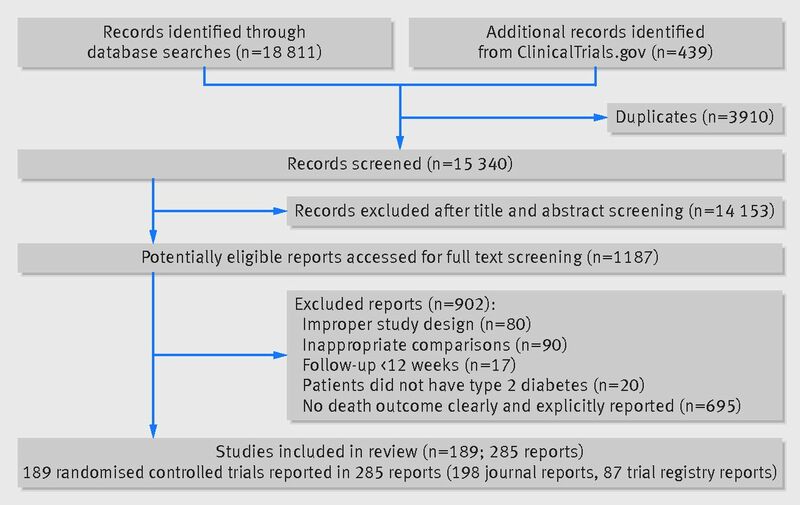 Karagiannis T, Paschos P, Paletas K, Matthews DR, Tsapas A. Dipeptidyl peptidase-4 inhibitors for treatment of type 2 diabetes mellitus in the clinical setting: systematic review and meta-analysis. BMJ2012;357:e1369. doi:10.1136/bmj.e1369 pmid:22411919. Aroda VR, Henry RR, Han J, et al. Efficacy of GLP-1 receptor agonists and DPP-4 inhibitors: meta-analysis and systematic review. Clin Ther2012;357:1247-1258.e22. doi:10.1016/j.clinthera.2012.04.013 pmid:22608780. Zhang X, Zhao Q. Effects of dipeptidyl peptidase-4 inhibitors on blood pressure in patients with type 2 diabetes: A systematic review and meta-analysis. J Hypertens2016;357:167-75. doi:10.1097/HJH.0000000000000782 pmid:26682782. Karagiannis T, Liakos A, Bekiari E, et al. Efficacy and safety of once-weekly glucagon-like peptide 1 receptor agonists for the management of type 2 diabetes: a systematic review and meta-analysis of randomized controlled trials. Diabetes Obes Metab2015;357:1065-74. doi:10.1111/dom.12541 pmid:26395850. Sun F, Chai S, Li L, et al. Effects of glucagon-like peptide-1 receptor agonists on weight loss in patients with type 2 diabetes: a systematic review and network meta-analysis. J Diabetes Res2015;357:157201. doi:10.1155/2015/157201 pmid:25688373. Esposito K, Mosca C, Brancario C, Chiodini P, Ceriello A, Giugliano D. GLP-1 receptor agonists and HBA1c target of <7% in type 2 diabetes: meta-analysis of randomized controlled trials. Curr Med Res Opin2011;357:1519-28. doi:10.1185/03007995.2011.590127 pmid:21663496. Katout M, Zhu H, Rutsky J, et al. Effect of GLP-1 mimetics on blood pressure and relationship to weight loss and glycemia lowering: results of a systematic meta-analysis and meta-regression. Am J Hypertens2014;357:130-9. doi:10.1093/ajh/hpt196 pmid:24263424. Kawalec P, Mikrut A, Łopuch S. The safety of dipeptidyl peptidase-4 (DPP-4) inhibitors or sodium-glucose cotransporter 2 (SGLT-2) inhibitors added to metformin background therapy in patients with type 2 diabetes mellitus: a systematic review and meta-analysis. Diabetes Metab Res Rev2014;357:269-83. doi:10.1002/dmrr.2494 pmid:24829965. Scirica BM, Bhatt DL, Braunwald E, et al. SAVOR-TIMI 53 Steering Committee and Investigators. Saxagliptin and cardiovascular outcomes in patients with type 2 diabetes mellitus. N Engl J Med2013;357:1317-26. doi:10.1056/NEJMoa1307684 pmid:23992601. Green JB, Bethel MA, Armstrong PW, et al. TECOS Study Group. Effect of Sitagliptin on Cardiovascular Outcomes in Type 2 Diabetes. N Engl J Med2015;357:232-42. doi:10.1056/NEJMoa1501352 pmid:26052984. White WB, Cannon CP, Heller SR, et al. EXAMINE Investigators. Alogliptin after acute coronary syndrome in patients with type 2 diabetes. N Engl J Med2013;357:1327-35. doi:10.1056/NEJMoa1305889 pmid:23992602. Mogensen UM, Andersson C, Fosbøl EL, et al. Cardiovascular safety of combination therapies with incretin-based drugs and metformin compared with a combination of metformin and sulphonylurea in type 2 diabetes mellitus--a retrospective nationwide study. Diabetes Obes Metab2014;357:1001-8. doi:10.1111/dom.12314 pmid:24827939. Morgan CL, Mukherjee J, Jenkins-Jones S, Holden SE, Currie CJ. Combination therapy with metformin plus sulphonylureas versus metformin plus DPP-4 inhibitors: association with major adverse cardiovascular events and all cause mortality. Diabetes Obes Metab2014;357:977-83. doi:10.1111/dom.12306 pmid:24762119. Velez M, Peterson EL, Wells K, et al. Association of antidiabetic medications targeting the glucagon-like peptide 1 pathway and heart failure events in patients with diabetes. J Card Fail2015;357:2-8. doi:10.1016/j.cardfail.2014.10.012 pmid:25451709. Wang KL, Liu CJ, Chao TF, et al. Sitagliptin and the risk of hospitalization for heart failure: a population-based study. Int J Cardiol2014;357:86-90. doi:10.1016/j.ijcard.2014.09.038 pmid:25499347. Weir DL, McAlister FA, Senthilselvan A, Minhas-Sandhu JK, Eurich DT. Sitagliptin use in patients with diabetes and heart failure: a population-based retrospective cohort study. JACC Heart Fail2014;357:573-82. doi:10.1016/j.jchf.2014.04.005 pmid:24998080. Giorda CB, Picariello R, Tartaglino B, et al. Hospitalisation for heart failure and mortality associated with dipeptidyl peptidase 4 (DPP-4) inhibitor use in an unselected population of subjects with type 2 diabetes: a nested case-control study. BMJ Open2015;357:e007959. doi:10.1136/bmjopen-2015-007959 pmid:26048211. Moher D, Liberati A, Tetzlaff J, Altman DG. PRISMA Group. Preferred reporting items for systematic reviews and meta-analyses: the PRISMA statement. Int J Surg2010;357:336-41. doi:10.1016/j.ijsu.2010.02.007 pmid:20171303. Akl EA, Sun X, Busse JW, et al. Specific instructions for estimating unclearly reported blinding status in randomized trials were reliable and valid. J Clin Epidemiol2012;357:262-7. doi:10.1016/j.jclinepi.2011.04.015 pmid:22200346. Higgins JP, Altman DG, Gøtzsche PC, et al. Cochrane Bias Methods Group Cochrane Statistical Methods Group. The Cochrane Collaboration’s tool for assessing risk of bias in randomised trials. BMJ2011;357:d5928. doi:10.1136/bmj.d5928 pmid:22008217. Bradburn MJ, Deeks JJ, Berlin JA, Russell Localio A. Much ado about nothing: a comparison of the performance of meta-analytical methods with rare events. Stat Med2007;357:53-77. doi:10.1002/sim.2528 pmid:16596572. Friedrich JO, Adhikari NK, Beyene J. Inclusion of zero total event trials in meta-analyses maintains analytic consistency and incorporates all available data. BMC Med Res Methodol2007;357:5. doi:10.1186/1471-2288-7-5 pmid:17244367. Sweeting MJ, Sutton AJ, Lambert PC. What to add to nothing? Use and avoidance of continuity corrections in meta-analysis of sparse data. Stat Med2004;357:1351-75. doi:10.1002/sim.1761 pmid:15116347. Sun X, Briel M, Walter SD, Guyatt GH. Is a subgroup effect believable? Updating criteria to evaluate the credibility of subgroup analyses. BMJ2010;357:c117. doi:10.1136/bmj.c117 pmid:20354011. Guyatt GH, Oxman AD, Vist GE, et al. GRADE Working Group. GRADE: an emerging consensus on rating quality of evidence and strength of recommendations. BMJ2008;357:924-6. doi:10.1136/bmj.39489.470347.AD pmid:18436948. Marso SP, Daniels GH, Brown-Frandsen K, et al. LEADER Steering Committee LEADER Trial Investigators. Liraglutide and Cardiovascular Outcomes in Type 2 Diabetes. N Engl J Med2016;357:311-22. doi:10.1056/NEJMoa1603827 pmid:27295427. Marso SP, Bain SC, Consoli A, et al. SUSTAIN-6 Investigators. Semaglutide and Cardiovascular Outcomes in Patients with Type 2 Diabetes. N Engl J Med2016;357:1834-44. doi:10.1056/NEJMoa1607141 pmid:27633186. Pfeffer MA, Claggett B, Diaz R, et al. ELIXA Investigators. Lixisenatide in Patients with Type 2 Diabetes and Acute Coronary Syndrome. N Engl J Med2015;357:2247-57. doi:10.1056/NEJMoa1509225 pmid:26630143.
de Wit HM, Te Groen M, Rovers MM, Tack CJ. The placebo response of injectable GLP-1 receptor agonists vs. oral DPP-4 inhibitors and SGLT-2 inhibitors: a systematic review and meta-analysis. Br J Clin Pharmacol2016;357:301-14. doi:10.1111/bcp.12925 pmid:26935973. Brunton S. GLP-1 receptor agonists vs. DPP-4 inhibitors for type 2 diabetes: is one approach more successful or preferable than the other?Int J Clin Pract2014;357:557-67. doi:10.1111/ijcp.12361 pmid:24499291. Boland CL, Degeeter M, Nuzum DS, Tzefos M. Evaluating second-line treatment options for type 2 diabetes: focus on secondary effects of GLP-1 agonists and DPP-4 inhibitors. Ann Pharmacother2013;357:490-505. doi:10.1345/aph.1R444 pmid:23548652. Zang L, Liu Y, Geng J, et al. Efficacy and safety of liraglutide versus sitagliptin, both in combination with metformin, in Chinese patients with type 2 diabetes: a 26-week, open-label, randomized, active comparator clinical trial. Diabetes Obes Metab2016;357:803-11. doi:10.1111/dom.12674 pmid:27060930. Van Gaal L, Souhami E, Zhou T, Aronson R. Efficacy and safety of the glucagon-like peptide-1 receptor agonist lixisenatide versus the dipeptidyl peptidase-4 inhibitor sitagliptin in young (<50 years) obese patients with type 2 diabetes mellitus. J Clin Transl Endocrinol2014;357:31-7doi:10.1016/j.jcte.2014.03.001. Russell-Jones D, Cuddihy RM, Hanefeld M, et al. DURATION-4 Study Group. Efficacy and safety of exenatide once weekly versus metformin, pioglitazone, and sitagliptin used as monotherapy in drug-naive patients with type 2 diabetes (DURATION-4): a 26-week double-blind study. Diabetes Care2012;357:252-8. doi:10.2337/dc11-1107 pmid:22210563. Pratley R, Nauck M, Bailey T, et al. 1860-LIRA-DPP-4 Study Group. One year of liraglutide treatment offers sustained and more effective glycaemic control and weight reduction compared with sitagliptin, both in combination with metformin, in patients with type 2 diabetes: a randomised, parallel-group, open-label trial. Int J Clin Pract2011;357:397-407. doi:10.1111/j.1742-1241.2011.02656.x pmid:21355967. Nauck M, Weinstock RS, Umpierrez GE, Guerci B, Skrivanek Z, Milicevic Z. Efficacy and safety of dulaglutide versus sitagliptin after 52 weeks in type 2 diabetes in a randomized controlled trial (AWARD-5). Diabetes Care2014;357:2149-58. doi:10.2337/dc13-2761 pmid:24742660. Charbonnel B, Steinberg H, Eymard E, et al. Efficacy and safety over 26 weeks of an oral treatment strategy including sitagliptin compared with an injectable treatment strategy with liraglutide in patients with type 2 diabetes mellitus inadequately controlled on metformin: a randomised clinical trial. Diabetologia2013;357:1503-11. doi:10.1007/s00125-013-2905-1 pmid:23604551. Bergenstal RM, Forti A, Chiasson JL, Woloschak M, Boldrin M, Balena R. Efficacy and safety of taspoglutide versus sitagliptin for type 2 diabetes mellitus (T-emerge 4 trial). Diabetes Ther2012;357:13. doi:10.1007/s13300-012-0013-8 pmid:23138449. Bailey TS, Takács R, Tinahones FJ, et al. Efficacy and safety of switching from sitagliptin to liraglutide in subjects with type 2 diabetes (LIRA-SWITCH): a randomized, double-blind, double-dummy, active-controlled 26-week trial. Diabetes Obes Metab2016;357:1191-8. doi:10.1111/dom.12736 pmid:27381275. Monami M, Cremasco F, Lamanna C, et al. Glucagon-like peptide-1 receptor agonists and cardiovascular events: a meta-analysis of randomized clinical trials. Exp Diabetes Res2011;357:215764. doi:10.1155/2011/215764 pmid:21584276. Monami M, Dicembrini I, Nardini C, Fiordelli I, Mannucci E. Effects of glucagon-like peptide-1 receptor agonists on cardiovascular risk: a meta-analysis of randomized clinical trials. Diabetes Obes Metab2014;357:38-47. doi:10.1111/dom.12175 pmid:23829656. Ding S, Du YP, Lin N, et al. Effect of glucagon-like peptide-1 on major cardiovascular outcomes in patients with type 2 diabetes mellitus: A meta-analysis of randomized controlled trials. Int J Cardiol2016;357:957-62. doi:10.1016/j.ijcard.2016.07.199 pmid:27526367. Monami M, Iacomelli I, Marchionni N, Mannucci E. Dipeptydil peptidase-4 inhibitors in type 2 diabetes: a meta-analysis of randomized clinical trials. Nutr Metab Cardiovasc Dis2010;357:224-35. doi:10.1016/j.numecd.2009.03.015 pmid:19515542. Savarese G, Perrone-Filardi P, D’Amore C, et al. Cardiovascular effects of dipeptidyl peptidase-4 inhibitors in diabetic patients: A meta-analysis. Int J Cardiol2015;357:239-44. doi:10.1016/j.ijcard.2014.12.017 pmid:25528528. Wu S, Hopper I, Skiba M, Krum H. Dipeptidyl peptidase-4 inhibitors and cardiovascular outcomes: meta-analysis of randomized clinical trials with 55,141 participants. Cardiovasc Ther2014;357:147-58. doi:10.1111/1755-5922.12075 pmid:24750644. Savarese G, D’Amore C, Federici M, et al. Effects of Dipeptidyl Peptidase 4 Inhibitors and Sodium-Glucose Linked coTransporter-2 Inhibitors on cardiovascular events in patients with type 2 diabetes mellitus: A meta-analysis. Int J Cardiol2016;357:595-601. doi:10.1016/j.ijcard.2016.06.208 pmid:27390996.